On Sunday, October 16th, Hofstra Women’s Club Rugby won their first round playoff game against Fordham University, 62-17. Alexa Strickland, Lili Hinojoss Madrid, and Ashley Higby all scored their first tries of the season, while Redate Negussie scored the first of her career. Gabby Jones scored four tries, and Kaelyn Ragonese made five kicks in Hofstra’s win. The Pride move on to play the University of Albany in the next round of the playoffs on Sunday, October 23rd. Hofstra Men’s Club Rugby took the pitch against Marist College for their final regular season game on Sunday, October 16th. Hofstra sought their first win and they found it in a big way. 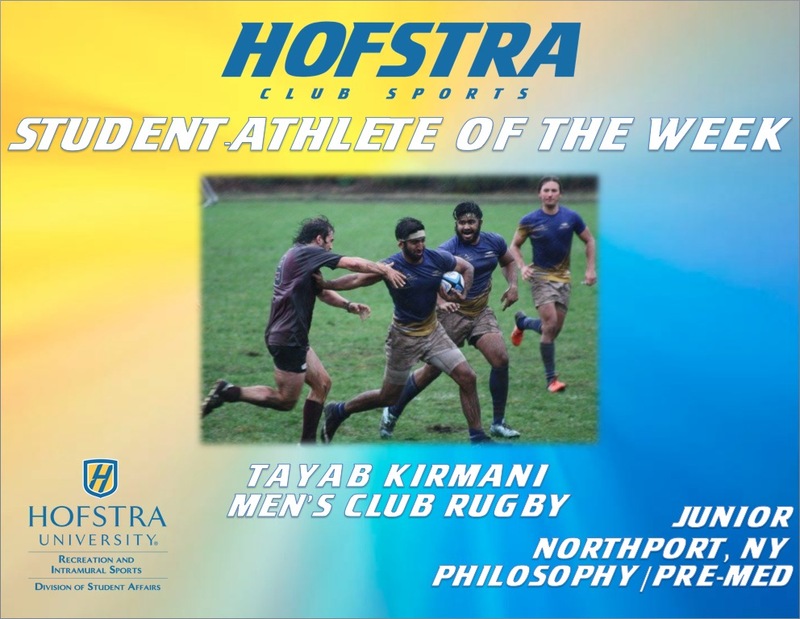 Captain Josh Beck scored 5 tries to help proper Hofstra to victory. 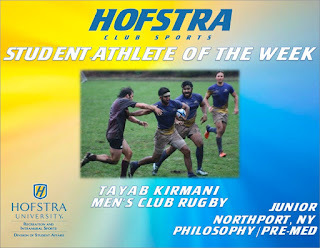 Colin Tomaselli-Greenslade, Yusuke Miyajima, James Thompson, Noel Shewjattan, and Kyle Novak added tries of their own. Overall, Hofstra dominated the match offensively and defensively. Hofstra has progressed throughout the season and because of their competitiveness, they have earned a spot in the playoffs. They will look for a playoff upset against William Paterson University in the Pride’s return to the postseason on Sunday, October 23rd. Hofstra Club Baseball traveled to Philadelphia, Pennsylvania to take on Drexel University for a three game set from Friday, October 14th to Sunday, October 16th. In Game 1 of the NCBA Conference series, Justin Cusano took the hill to open conference play for the Pride’s 2017 season. Things did not go very smooth for Cusano, as he failed to get out of the second inning for the first time in his 4-year Hofstra Club Baseball career. He allowed 6 earned runs in 1.1 IP. Behind Cusano, Steven Pekarik came in and shut the Drexel Dragons down for the remaining 5.2 IP, but the bats never came alive and Drexel beat Hofstra, 8-1. In Game 2, junior Sean Cunningham took the hill for the Hofstra. Through 6 innings the Pride had played a clean, defensive game and trailed the Dragons 2-0. It wasn’t until the top of the 7th inning when the Pride got things started. The Pride erupted for 8 runs, with the big knock being Kevin Cunningham’s bases clearing, 3 run triple that staked the Pride to an 8-2 lead. Drexel would mount their own rally in the bottom of the 7th, but the Pride bullpen shut the door, and Hofstra evened the series at 1 game apiece with an 8-5 victory. In the rubber game of the series, P.J. Potter took the mound for the Pride, and he was masterful, pitching 9 innings and allowing only 1 earned run while scattering 6 hits. However, the Pride would find themselves down 3-0 in the 5th inning. Not a problem for the comeback kids from Hempstead, as the Pride rallied with 4 runs to grab the lead 4-3. Hofstra would add insurance runs in the 7th and 8th as well to put Drexel away, 8-4, and take the rubber game of the three game set. Hofstra Women's Club Soccer traveled to New Jersey to take on Stevens Institute of Technology on Saturday, October 15th. Despite playing a solid game, the Pride were unable to find the back of the net, falling to Stevens, 2-0. On Sunday, October 16th, the Pride hosted both Montclair State University and SUNY New Paltz. In the first game against Montclair, Heather Aleksis scored for the Pride, as they battled to a 1-1 tie with the Red Hawks. Emma Fasolino played excellent in net behind the solid defense of Sarah Bouzaidi, Marisa Saia, and Hannah Carmeli. In the second game of the day, SUNY New Paltz and Hofstra played a well matched game. Goals were scored for the Pride by Sarah Cordes, Heather Aleksis, and Gabby Cottone. Madison Webb played excellent at midfield, and Katie Spoleti played solid defense in the Pride’s 3-2 victory. On Sunday, October 9th, Hofstra Club Ice Hockey played MCHC rival Fordham University at the Ice Hutch in Mount Vernon, New York. Hofstra and Fordham both got on the board early in the game; however, Fordham would quickly pull away beating Hofstra 8-1. Friday, October 14th, Hofstra hosted the reigning MCHC champion Yale Bulldogs. Hofstra opened up the scoring with a power play goal scored by Darren Schwartz and assisted by Joe Grice. Yale would quickly answer to even the score at 1 apiece. Going into the third period, Hofstra trailed 2-1. Joe Grice would score in the middle of the period to even the score at 2, but that would be all for the Pride. Yale would score a late 3rd period goal and go on to win 3-2. 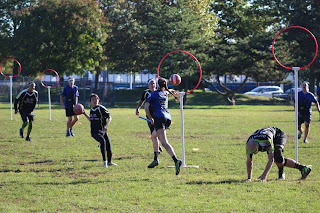 On Saturday, October 15th, Hofstra Club Quidditch hosted a 12 team tournament where the top teams from the East Coast came to compete on Hofstra’s campus. In the first round of pool play Hofstra faced the defending National Champions, Quidditch Club Boston, where they suffered a loss, 10-180. Erin Daley scored the only goal for the Flying Dutchmen. Hofstra continued to play four more games throughout the day against the University of Rochester, Tufts University, Rutgers University, and New York University. Even though the Flying Dutchmen were not able to pull out a win, they consider the tournament a success and are working on improving for regionals. Hofstra Club Equestrian competed at Olde Towne Equestrian Center on Sunday, October 16th. Maria Sorrentino placed 6th over fences. Katie Jackson, Katie Rozek, and Hannah Matuszak all rode well in their respective classes, with Jackson claiming a 5th place ribbon, while Rozek took home a 4th place ribbon. Hofstra Running Club took part in the St. John's Cross Country Fall Festival at Cunningham Park in Queens, New York on Sunday, October 16th. On the women's side, Freshman Courtney Gallagher ran the 4K in a time of 18:01, which was good enough to finish 8th overall in the club division. On the men's side, sophomore Ryan Connell was Hofstra's top finisher crossing with a 5k time of 17:46. This was good enough for 41st overall and 7th in the club standings. Hofstra's next finisher was sophomore Andrew Grell who ran 20:34. Freshman Tyler Baron (21:36) and junior Adel Elkosh (25:59) rounded out a solid effort for the Pride. Hofstra Men's Club Lacrosse took on Fordham University under the lights at Shuart Stadium on Wednesday, October 19th. Hofstra and Fordham played a hard fought game, but the Pride fell to Fordham, 12-8. Keith Marlor finished the night with four goals for Hofstra. Hofstra Club Roller Hockey traveled to Warwick, Rhode Island to take on the Minutemen from the University of Massachusetts. Hofstra fell to UMass by a score of 6-0.